I had this one in my Que to post, but see it came up on FlipsideMN’s blog, but I have added it here as Ken’s review may be of interest to some. James Vincent also has 2 solo Christian albums listed in The Archivist. 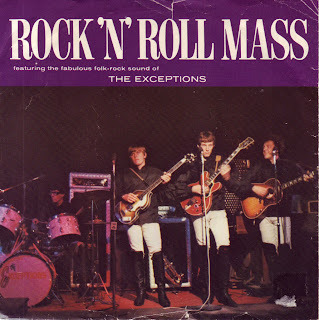 There is also a CD of the rest of the Exceptions songs most of which appear to be of a more secular nature. Here are some interesting links on what these artist have gone on to do. This is great stuff. A real beat sound. Love the Holy Holy Holy which has the garagiest sound of all the movements. The only shame is that they didn't include the Creed. 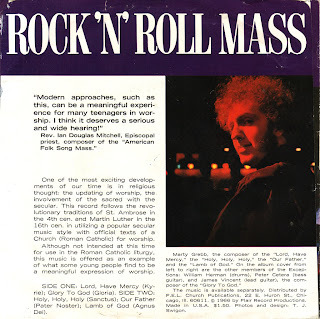 On the back cover, Rev. Ian Mitchell gives it the big thumbs up. This is a good one. I was glad to find it. Wish they had put out more gospel stuff. I wonder where you can download his solo gospel stuff? Chris, any possibility of getting a back cover scan I could add? James Vincent's solo albums and work with other groups can be found here. Additional Execption album can be found here. Featuring Peter Cetera. All songs originally recorded in monaural using various studios throughout Chicago, and some songs were recorded in only an hour or two, due to shoestring budgets. These recordings were made between 1964 and 1967. For this release they have been digitally re-mastered with simulated stereo sound. Although a "must have" for any Peter Cetera and/or Exceptions fan, most would no doubt agree that these recordings fall far short of capturing the essence of what the band delivered live. This CD is being offered in response to numerous requests from those who remember those live performances, as well as from the many who are just curious. I guess this is what one calls rare. I am suprised on a daily basis, could too much of this be harmful…I wonder, I wander, I wunder…ek wonder. I found the images on photobucket. I think they were posted by Ed Nodorozny who is an expert of the Christian beat scene.